Mass incarceration and police stop-and-frisk program discussed at weekend event. The Justice Tour. Photo by Isiah Holmes. Inequitable treatment of minorities by the justice system was the topic Saturday at the American Civil Liberty Union’s Justice Tour, held at the Downtown library. It was also the topic, in a slightly different way, at a Red Table Talk held at UW-Milwaukee a week before this. The ACLU event was held in the Centennial Hall of the Milwaukee Public Library, near Wisconsin Avenue and 8th St., and, appropriately, not far from the Milwaukee Police Department’s District 1 headquarters, the county jail, and courthouse. Speakers included ALCLU attorneys, members of various community organizations, university professors, former incarcerated people and many others. The main focus was the ACLU’s stop-and-frisk lawsuit against the Milwaukee Police Department. Red Table Talk Photo by Isiah Holmes. Filed in July 2018, the lawsuit ended in a $1.9 million settlement and five- year consent decree to end the stop-and-frisk program. The ACLU charged that MPD’s program violated the constitutional rights of countless people, mostly African American, Latinax, and low income residents. Former Police Chief Edward A. Flynn denied the MPD targeted minorities, calling stop-and-frisk an effective crime-fighting tool that targeted high-crime neighborhoods. But the department agreed to settle the lawsuit and change its approach. 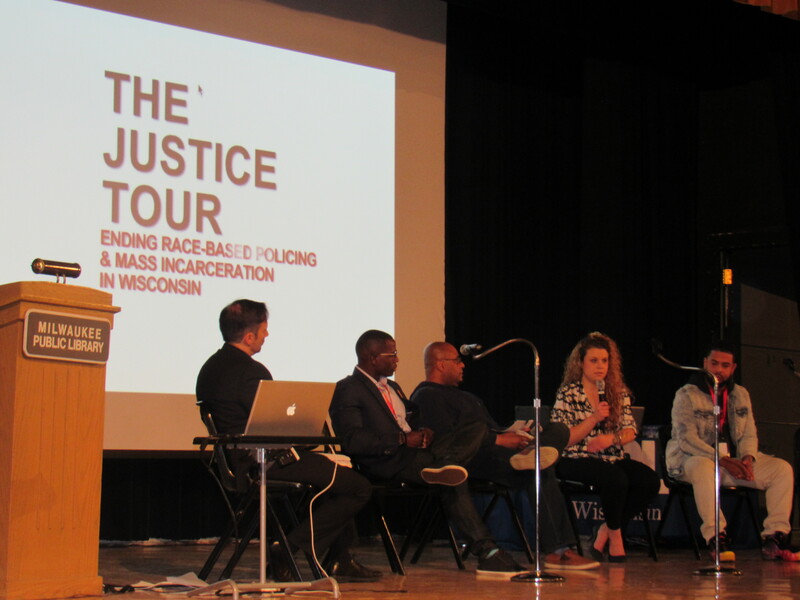 The department is now required to pursue reforms, and Tammy Rivera, a speaker at the Justice Tour, explained that each of Milwaukee’s communities is also being surveyed on the reforms. She stressed that a diverse survey selection is gathering information across demographics: “From the Hmong communities, to African Americans, we wanted to make sure everyone’s voice was heard,” she said. Rivera, who is executive director of South Side Organizing Committee, noted that reform is tough to institute: “government bureaucracy is just brutal to deal with,” she noted. Yet she remains encouraged. “It’s the first time in Milwaukee’s history that we have this many people of color in power,” she told the crowd of over 80. She included Milwaukee’s new police chief Alfonso Morales in this statement. Melissa Ludin, a panelist and Board President of EXPO (Ex-Incarcerated People Organizing), noted that women are also particularly victimized by mass incarceration. “The biggest thing that’s fueled the mass incarceration of women is the drug war,” she told the crowd. Ludin explained that drug problems for women which earn them jail time are often rooted in trauma and abuse. Almost always, she said, that abuse comes from loved ones. Smart Justice campaign organizer Sean Wilson shared a story of a woman he knew who was victimized by parole. He explained how she went to her parole officer asking for drug treatment after a relapse. Instead, she was detained. While much of this involves state policy, Milwaukee’s jails and detention centers have become notorious in recent years. The Milwaukee County Jail has been immersed in controversy, including the death of 38-year-old Terrill Thomas in 2016, who died of dehydration after being locked in a solitary cell without water, for a week. Also controversial has been the Milwaukee Secure Detention Facility (MSDF), which houses parole violators. MSDF is notorious for being overcrowded, while also keeping prisoners inside their cells for 20 hours or more. On October 8th a movement against the facility, Close MSDF, hosted it’s annual MSDF Anti-Anniversary. It’s held on the day MSDF opened it’s doors in 2001, and honors the 17 people who’ve died there. Wilson offered a summary of sorts of what’s happening in Wisconsin: “We, in little old Wisconsin, are competing with the world in incarceration,” he noted. A week before this, on October 4th, the Kappa ETA chapter of UW-Milwaukee’s Delta Sigma Theta Sorority hosted a Red Table Talk. The meeting of nearly 40, mostly young African American students and residents, discussed the state of social justice in Milwaukee. 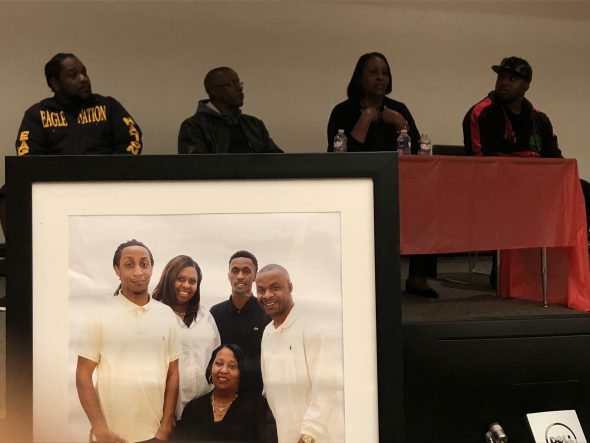 Featured speakers were Linda and Jay Anderson, Sr., parents of 25-year-old Jay Anderson, Jr., who was shot and killed by a Wauwatosa PD officer in 2016. Other speakers included local activists and organizers Tory Lowe, and Vaun Mayes. Mayes has been indicted for an alleged attempt to firebomb MPD’s District 7 during the 2016 unrest in Sherman Park, though scores of community members have voiced support for him. “He was a threat to no one,” Lowe proclaimed to the crowd. Lowe and Mayes stressed to the youthful crowd that it’s critical they organize for issues important to them. While voting is important, this isn’t the only thing they can do. “Every day you’re on your phone, learn a new law,” Lowe said.